RJE Business Interiors is a proud supporter of the United Way of Central Indiana. The United Way of Central Indiana helps sustain vital human services for those who need it the most while reducing such needs for future generations. RJE has held a 100% employee participation rate for the last six years during the United Way's annual campaign. Our Indianapolis office furniture dealership continues to support the organization through participation on the Board, Emerging Leaders Steering Committee, the ReadUP program, Oscar Night Committee, along with various other committees. RJE's participation with the organization will continue to prosper! RJE participates in the United Way of Central Indiana's annual meeting each year. Over 900 people gather in downtown Indianapolis to celebrate the success of the organizations fundraising campaign. This year the event was held on March 22, at the Indiana Roof Ballroom. RJE supported the event by sponsoring a table and participating in the organizations fun, celebratory activities. 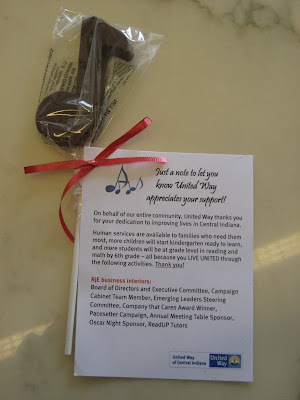 Each table was personalized with a special chocolate music note that included all the ways each organization has been involved with the United Way. The event was a true success and RJE Business Interiors is honored to be a partner of the United Way of Central Indiana!